- AUD retreats from 2019 high after housing market, China wobble. - Data comes as iron ore supports AUD, ahead of crunch RBA meeting. - Morgan Stanley says sell AUD, as fresh weakness is likely up ahead. - Declines could be temporary as broader picture supportive of AUD. The Australian Dollar slipped from a 2019 high during the overnight session Friday after IHS Markit figures showed China's manufacturing sector sliding deeper into recession this month and other data revealed a continued fall in Aussie house prices at the start of the New Year. China's manufacturing PMI fell to from 49.7 to 48.3 this month when markets had looked for a decline to only 49.5, as both output and new order flows into the world's top manufacturing economy contracted in the New Year. "January’s survey indicated a generally subdued trend in total new work placed with Chinese goods producers. Underlying data indicated that weakness largely stemmed from muted domestic demand, as new work from abroad rose slightly at the start of the 2019," says IHS Markit, the survey compiler. This has seen Australia's Dollar shift firmly onto its back foot ahead of the weekend although markets remain optimistic that a deal to end the U.S.-China trade war could emerge over the coming weeks, ahead of a March 01 deadline, which would act as a lifeline for the world's second largest economy. Negotiators from the U.S. and China are attempting to reach a deal that ends the tariff fight between them before the March deadline that sees the 10% tariff levied by the White House, on annual imports from China of some £200 billion worth of goods, automatically rise to 25%. "Cling together, swing together. The Australian dollar is under pressure today as a result of weak Chinese data. That makes sense: if the most important trade partner is under pressure that is not good news for one’s own economy," says Thu Lan Nguyen, an analyst at Commerzbank. The is matters for the Aussie because it is effectively underwritten by the nation's mammoth iron ore and other commity trade with China, which means the currency is sensitive to news about both the Chinese as well as global economies. The Aussie is also strongly correlated with China's Renmimbi. Australia's commodity connection had been a source of support this week given how futures prices of iron ore, the country's single largest export, have risen by almost 20% thus far in 2019. Vale, the Brazilian mining firm, is decommissioning 10 dams following a disaster at one of its sites earlier this month. "A much weaker January Caixin manufacturing Chinese PMI prompted CNY selling," says Adam Myers, a currency strategist at Commonwealth Bank of Australia. "It fell deeper into contraction territory to a three‑year low. It suggests China’s domestic economy is slowing rapidly. Not just the larger export‑focused sectors." 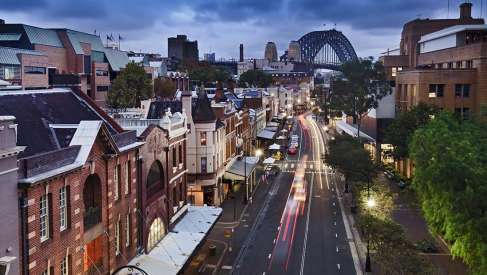 IHS Markit's PMI report came ahead of CoreLogic data that showed house prices falling in seven out of Australia's eight major cities this month, with Canberra the only state capital to see an increase in prices. Fears are that a prolongued downturn in prices will create negative wealth effects that hurt the economy by deterring households away from spending. That could sap demand from the economy, reduce inflation and ultimately force the Reserve Bank of Australia into an interest rate cut during the year ahead. "Our analysis here shows some tentative evidence of a negative wealth effect. Next week’s RBA communication with provide an important update on their thinking related to the housing market. Key will be whether RBA governor Phil Lowe discards the forward guidance that “the next move in the cash rate being more likely to be an increase than a decrease,” says CBA's Myers. The Reserve Bank of Australia has held its rate at a record low of 1.5% for over two years now, citing below-target inflation and an economic outlook that is not sufficient enough for it to support a sustainable return of the consumer price index to within the 2%-to-3% target band in the short-term. Given that U.S. interest rates reached 2.5% last year, bond market yields have long provided incentive for investors to sell or avoid the Antipodean currency, and to buy the U.S. Dollar instead. Similar dynamics have been in play with other exchange rates. The RBA is expected to update its interest rate guidance at its February meeting next week, which will be a key moment for the Aussie because markets will be looking to see if the bank abandons its projection that "the next move in rates will be up". "We expect a weaker AUD over the next week as the RBA softens its tone and higher domestic mortgage rates continue to weigh on data releases, like building approvals. A weaker than expected trade balance print could provide evidence that a slowdown in regional trade is affecting the Australian economic outlook too," warns Hans Redeker, head of FX strategy at Morgan Stanley. "We continue to see higher funding costs leading to negative wealth effects, lower consumption and a weaker AUD." The Australian Dollar rose to become the second best performing G10 currency of 2019 on Thursday as its economic and financial stars continued conspiring to engineer a more protracted recovery for the Antipodean unit. A sharp rise in iron ore futures prices are without doubt the most significant contributor to this week's gains by the Australian Dollar, although signs of that a deal to end the U.S.-China trade war is in the pipeline, resilient domestic inflation figures and an interest rate capitulation by the Federal Reserve (Fed) have also been at play too. Iron ore futures prices rose sharply overnight on most exchanges after Brazilian mining firm Vale said it will decommission 10 mining dams in response to a tragic disaster at one of its domestic sites earlier this month. The most notable support for the Aussie this week followed the U.S. Federal Reserve's suggestion that policymakers aren't yet sure they'll even need to raise rates at all this year. Previously the Fed said "further gradual increases" in interest rates would be required to prevent inflation from rising meaningfully above the 2% target, which was a staple line that has appeared in almost all policy statements during the last three years or more. But the Fed abandoned that judgement on Wednesday and is now simply going to be "patient" while it waits for U.S. and global economic developments to dictate whether any further rate rises are going to be necessary over the coming quarters. "Given overweight positions in the US late last year and under-invested positions of the buy-side currently, we suspect investors will continue to cautiously put money to work in under-valued high yield currencies. They will do this until they see clear signs of a re-escalation in trade tensions (US tariffs on auto imports could be a story mid February) or there are other signs of a hard landing. This then should mainly be a story of USD weakness," says Chris Turner, analyst at ING Bank. The Fed's shifting stance could easily pull the proverbial rug out from under the U.S. Dollar this year, providing the Aussie with respite from some of the bond market pressures that helped force it close to a double digit loss in 2018. The Australian Dollar is highly correlated with stocks and 'risk on' assets so any improvement in global market conditions would be supportive. And if the Fed is to ease back on the pace it intends to raise interest rates, global markets could be set for further advances.